My love for Disney ignited when I traveled there with my family as a little girl. The first trip I can remember was when I was four years old. I was fascinated by the characters and Cinderella’s castle took my breath away. The attractions, parades and fireworks were thrilling to me! When I go back now, I have the fondest memories of being there with my family and I can still see Disney from a child’s eyes. I want to provide those same magical memories and feelings for my own children. I took a fateful trip to Disney in 2001 with my husband and our two boys, who were 3 and 1 at the time. When the trip was over, my exhausted husband proclaimed that we weren’t going back. It was a trip filled with long lines, big crowds and whiny kids. We ate fast food for every meal and I thought we should tour the park from open to close. It was not the magical vacation we had envisioned. Four years later, when I finally convinced my husband to return, I knew I had to be more prepared. I spent almost a year poring over websites, message boards and books about doing Disney right. I researched planning strategies, crowd levels, the FASTPASS system, character meals and I read reviews and tips from Disney vacationers. I planned time to relax and enjoy the wonderful amenities the Disney Resorts have to offer. It turned out to be a dream vacation with lots of precious memories! It thrills me to share my knowledge with my clients so that they too can experience a vacation full of great memories and big smiles! I have always heard you should go into business doing what you love! Well, for me that is Disney. I love, love, LOVE Disney and think, talk, dream, and read about Disney World in some way every day. If I can’t plan a trip for my family nothing makes me happier than planning a Disney dream for someone else. My husband and I honeymooned there 25 years ago with dreams of returning with children in years to come. Our first trip as parents of a five year old was like a homecoming for us. If time invested is proof of passion, my heart is at the front of Cinderella castle. I have always been a planner as planning is half the fun of a trip! When we go to Disney World now, we have favorites we must do but always mix in new experiences. Our trips have been everything from celebrations of our fifteenth anniversary in luxury to budget-savers in more modest Disney resorts. We have stayed up to ten days at a time, traveled with other families multiple times, and could never choose a favorite trip! I have been fishing, done water sports, seen Cirque du Soleil, experienced behind-the-scenes tours, and enjoyed fireworks cruises. Of course, I am always the trip planner and have loved helping others see Disney as the ultimate family vacation destination. At last count, I had visited Disney World over thirty times! Chances are, I’ve stayed there, eaten there, ridden it, seen it, and can tell you all about it. My family doesn’t wait in lines and neither will you. We relax and enjoy our family time; you will too. We leave with a sincere desire to return as soon as possible and that is my goal for you! I want your family’s Disney experience to be practical, yet magical. I am a happy graduate of the College of Disney Knowledge. My friend Christy shares that goal. We can’t wait to send you to our happy place! Aloha! Jen Hrubetz has been with FTM Travel since 2012 and has loved every minute of it. Jen lives in Iowa and is a teacher, has three daughters, and they are all fans of Disney’s magic! At last count, Jen had visited Disney World 32 times since 2005, Disneyland once in 2016, and recently visited Disney’s Aulani Resort in Oahu! Disney is a way of life for Jen because she feels there is nothing like walking down Main Street, being greeted by Cinderella’s Castle. She is extremely knowledgeable in all things Disney! Her dream job is helping families with the most magical vacation experience of their lifetime. If you’re planning a solo trip, a couple’s getaway, a girls’ trip or a huge extended family trip packed with memories that will live forever, allow Jen to help you book the trip of your dreams. Cheryl Maxwell had her first visit to Walt Disney World in 1976 and as she walked down Main Street, she fell in love. She has visited over 20 times since then. She states “It is truly my happy place and I still get that same feeling from Main Street -the sights, smells, and sounds bring a smile immediately. My trips have included children, grandchildren, adults only, my parents and in-laws, girls’ getaways and even a 25th anniversary trip. Each trip allows me to experience something new that Disney has to offer and I even ran my first 5k at Wild World of Sports last year.” Cheryl enjoys Epcot’s Food and Wine Festival and her favorite time of year is the Christmas season when the entire property is transformed for the holidays. She has stayed at all levels of accommodations from the All Stars, to the cabins at Ft. Wilderness, to concierge at the Grand Floridian. Cheryl and her husband John live in Hancocks Bridge, NJ. They have five children and three grandchildren. She has a good deal of experience traveling WDW with mobility issues and she would love to share her knowledge with you. I am a wife and mother of 2 wonderful children, living in Houston, Texas. My husband is the biggest supporter of my love for all things Disney and my obsession of trip planning! We have traveled to Walt Disney World as a family 12 times since 2003, creating some of the best memories of our lives. We also recently sailed on the Disney Dream for the first time in March, 2015 and fell in love with Disney all over again! I am very excited to pursue my dream of helping other families create their own magical memories! Krista has traveled to Disneyland dozens of times, thanks to Grandparents who lived in Southern California while she was growing up, and to Walt Disney World over 15 times both as a child and an adult. She and her husband even honeymooned at Disney World and on the Disney Wonder. Krista says “My greatest memories as a kid comes from trips to Disney! As a 6 month old, I took my first trip to Disneyland with 10 family members trailing behind the stroller. As an adult, there is nothing like a couples’ trip or a girls’ weekend. There are always new things to see and do in addition to experiencing my sentimental favorites. Disney World isn’t just for kids and families and it is not just about the parks – the resorts and restaurants make it the perfect destination for adults and families alike. It truly is ‘my happy place’.” Krista lives in Lincoln, Nebraska with her husband Mike. Keith lives in Hendersonville, TN with his wife Amy and 3 children, Autumn, Noah and Macy. Keith grew up with memories of being stuffed into the conversion van with his older brother and sister and making numerous trips to Disney World. As the family has grown and children have been added, Disney continues to be the perfect place for the whole family to gather. Whether it’s the Disney resort at Vero Beach, Hilton Head, or the resorts at Disney World, a summer isn’t complete without seeing Mickey and Minnie. “We keep a growth chart like most folks have on the door in our playroom but instead of actual feet and inches, it shows what you can ride now!” Planning and booking a Disney vacation utilizes Keith’s joy for all that Disney has to offer and the desire to have a seamless adventure of fun, relaxation, and great meals for everyone. Rebecca Mitchell can’t get enough of all things Disney! On her first trip in grade school, she fell in love with the Magic and continues to fall in love with each visit. She and her son Will have been to Walt Disney World and Disneyland multiple times and look for new experiences in each visit. “The service at any Disney destination is top notch. Not having to worry about the little things helps you to truly immerse yourself and enjoy family time. The memories that we have created will last a lifetime and we always look forward to making more magical memories! I enjoy helping other people capture that magical feeling!” Rebecca and her son Will live in Brookfield, WI. 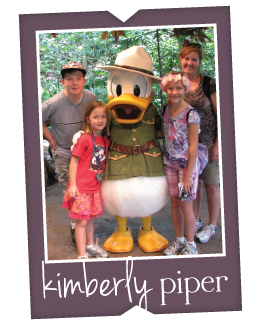 Kimberly Piper has traveled to Walt Disney World more than a dozen times, experiencing the Disney magic from many perspectives. “Whether I’m vacationing with my children, with extended family, or on a “girls’ weekend”, Walt Disney World always provides the perfect blend of fun and relaxation for everyone,” says Kim. Her favorite Disney moment, on any visit, is watching the Wishes fireworks display. She lives in New Hampshire with her three children. Bridgette adores ALL things Disney. When she took her son to Walt Disney World when he was a toddler, she fell in love! Since then, she has been on a mission to spend her family vacations at the most magical place in the world! As a hair stylist, she has shared her Disney knowledge with many clients is ready to share and help many more create memories that will last a lifetime! Bridgette lives in Rome, GA with her husband Tim and children, Thorne and Ivey. Allison Owens has always been told that her first trip to Walt Disney World was in 1971 when her mother was pregnant with her. Forty three years later and an estimated 25 plus trips since, Walt Disney World is still her favorite place to vacation! She states “My family has just always enjoyed going to Disney. It truly is a magical place!” Thankfully, she married someone who also enjoys Disney. Allison now gets to share her love of Disney with her two girls, Sydney and Sophie. “My girls would go to Disney every month if we could!” She has stayed at many of the different resorts at Walt Disney World… the value resorts, moderate resorts, Fort Wilderness cabins, as well as deluxe resorts. “There is so much to do and enjoy at Walt Disney World that you could go every year and never experience it all! Planning vacations for others to my favorite place is an absolute dream!” Allison resides in Ringgold, GA with her husband Darrell and her daughters, Sydney and Sophie. I first visited Disney World in the mid 1980’s and never lost the magic. When I traveled with my wife and two children in 2011 I began to research everything Disney to make sure our trip was as magical as my first 30 years ago. We enjoyed our trip so much that we were planning our next adventure as soon as we got back home. Since then we have been on Disney vacations twice a year researching and learning to make each trip better than the last. From Disney parks to Disney Cruise Line I am now fully prepared and confident I can assist any client book a dream Disney vacation! Let’s start making memories! April and her husband have been visiting Disney as a family since their son was two years old. They fell in love with the smiles, magic, and memories that can only happen at the most magical place on earth! As a child, she remembers meeting Mickey for the first time and says that seeing her son have the same reaction and element of magic was truly heart warming. April and her family love visiting Disney World because each trip entails new magic and adventures that creates memories that will never perish. They especially enjoy the ease of the Disney Dining Plan, Memory Maker, and staying at a Disney resort. April is excited to help make your trip magical and brimming with wonderful memories! April resides in Murfreesboro, Tennessee with her husband, Evan, their son, Owen, and their dog, Annabelle. Laura remembers traveling to Walt Disney World with her family as a child and it being a magical experience. Once she took her boys for the first time as toddlers, she fell in love all over again! Laura loves traveling to Disney World & experiencing the magic through her own eyes and the eyes of her children. Her whole family has a deep love for all things Disney & it is their favorite vacation spot. Laura and her husband, Ben, live in Brentwood, TN with their children, Grayson, Griffin, and Cheney. She is excited to have the opportunity to help other families plan their own magical trips to the happiest place in the world! When someone says the word vacation, Jennie thinks Disney! As a young child, she and her family visited Disney World several times and those are the first vacation memories she still thinks of to this day! She and her husband Fred spent their Honeymoon at Disney World. They have taken their two daughters, Allie and Anna, since they were in preschool and now they are teenagers. Jennie has traveled to Disney World to celebrate birthdays, spend time with extended family, as a chaperone for a school trip and has stayed at 6 different resorts. Jennie says, “I feel that family vacation time is meant to be intentional, whimsical, memorable and cherished.” No matter the ages or stages of your family, Jennie is ready to help you plan a magical trip that you and your family will never forget! Wendy lives in Brentwood TN with her husband and two kids, Garner and Leia (Princess Leia). In 2006, she honeymooned at Walt Disney World’s Grand Floridian with her husband and has traveled back every year, sometimes twice, since then. Wendy loves watching her kids experience the magic of a new attraction or fireworks show. She is a huge fan of Epcot’s International Food and Wine Festival and the special Holiday Parties at Magic Kingdom. Wendy enjoys traveling to Disney with her kids, but also knows how to experience all the parks on an adult vacation. She has loved helping her friends and family plan their vacations and she is excited to help all of her clients plan their own magical vacation! John Dostaler was bitten by the Disney bug in college over 25 years ago and has never looked back! Between visits to Disneyland and Walt Disney World, he has spent years in the travel industry guiding people to the perfect Disney vacation! Whether it’s sailing the high seas with Mickey or an immersive European trip with an Adventures by Disney itinerary, John will be there for you step by step. John and his husband Troy live in the Chicago suburbs with their children Everett and Emerson. Margo’s first visit to Walt Disney World was when she was three. Her parents drove from Atlanta, Georgia, spent the day at the Magic Kingdom, and drove back home all within 24 hours! Now, Margo lives in Leesburg, Georgia, about five hours from Walt Disney World, with her husband and daughter. Since that trip, Margo has marked monumental occasions with visits to “The Happiest Place on Earth”. She even celebrated graduating with her doctorate and honeymooned at Walt Disney World. Margo is not only a self-proclaimed Disney expert, she’s also a recent graduate of the Disney College of Knowledge. She will be thrilled to help you plan your family’s Disney vacation using her great first hand knowledge of the parks. Her favorite Disney vacation memory is having an early morning breakfast at Magic Kingdom’s Be Our Guest Restaurant, then getting the opportunity to ride The Seven Dwarfs Mine Train SIX times in a row before the park opened! Margo also enjoys planning for other travel destinations such as National Parks, beach and ski resorts, and European travel. Two of her all-time non-Disney World vacation destinations include Glacier National Park in Montana, and London, England. Margo is an avid distance runner and plans to take a group of fellow runners to the next Disney Princess Marathon Weekend at Walt Disney World. She absolutely cannot wait to plan for your family too! Amanda’s love of Disney started at the age of four with her first trip to Walt Disney World. She has been to Walt Disney World over two dozen times and with every trip, her love for Disney and “the Mouse” grows. Amanda has sailed on several Disney Cruises and has vacationed at Disneyland. Her love of all things Disney goes beyond just visiting the parks. In 2016, Amanda married her very own Prince Charming, Brandon and they brought Disney into their celebration with the theme of their favorite Disney character couples. They honeymooned at the most “Magical Place on Earth”. She enjoys making Disney connections with people she meets. One of Amanda’s most favorite Disney memories is celebrating her birthday at Walt Disney World. She started the day at the Magic Kingdom and had breakfast at the Crystal Palace with her favorite character, Piglet and the Hundred Acre Wood crew. Throughout the day, cast members and strangers wished and sang to her “Happy Birthday”, no birthday has ever been quite so special!